LOUNGE; Incorporates ample free standing / fixed comfortable sofas. SP63 combines both a traditional feel with modern style providing a welcoming, bright and relaxing atmosphere. This holiday home benefits from TV, DVD, Free view and gas fire. KITCHEN & DINING AREA; fitted kitchen furnished to a high standard with full size fridge and freezer, microwave, hob, cooker and extractor fan. The dining area is spacious and benefits from a comfortable free standing table and chairs. BEDROOMS: This accommodation has two bedrooms, one good size master with king size bed,en-suite toilet, room for travel cot fitted wardrobes and vanity area with stool. The twin room has small fitted wardrobe (twin beds can be pushed together to form a double). PLEASE NOTE: Total sleeping capacity is no more than six guests. BATHROOM & TOILET: SP63 benefits from a fully fitted shower room fitted with full size shower with glass door, toilet and wash basin. SP63 also has an additional toilet with wash basin attached to the master bedroom. VERANDA; YES, benefits from large glass panelled gated veranda complete with sea views. 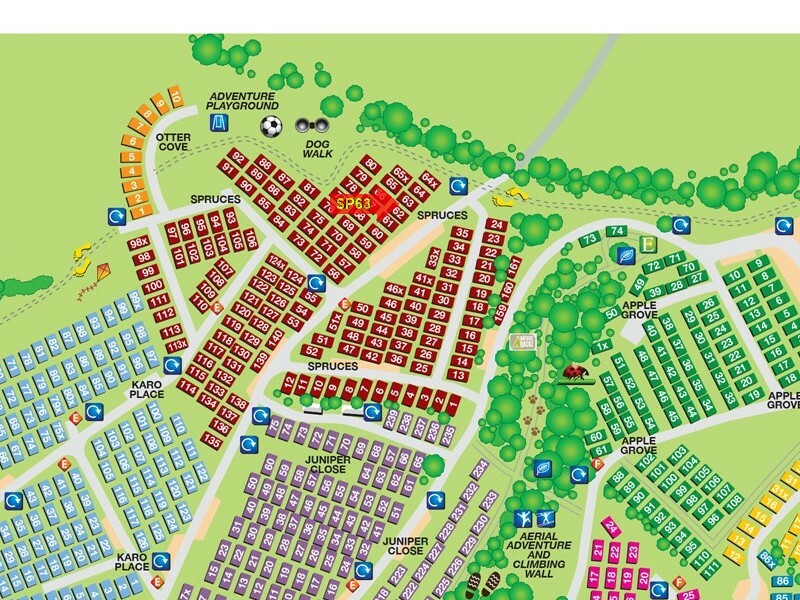 PARKING; SP63 has a gravelled area in front of the caravan. Please note this is not a marked parking space. DISTANCE TO MAIN AMENITIES; approx 7 to 9 minutes walk. NEAREST CARAVANS FOR GROUP BOOKINGS; To find the closest caravans for group bookings please click Browse Caravans at Devon Cliffs, then select The Spruces (SP) from the Park Area list and click Search.